Those at the check presentation included (L to R) UA professor Kevin Lansey, Terracon’s Derek Koller, department head Dominic Boccelli, and PhD student Arash Nikvar Hassani. 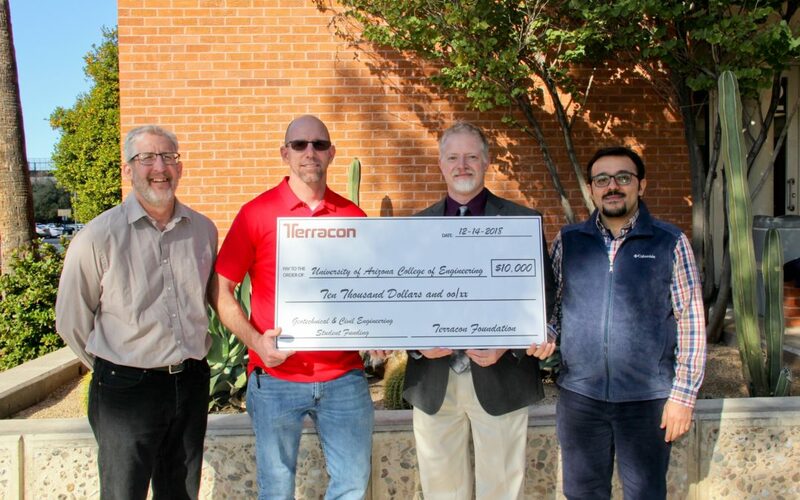 TEMPE, ARIZ. (January 22, 2019) – The Tucson office of engineering consulting firm Terracon presented a $10,000 check from its foundation to the University of Arizona College of Engineering. Terracon’s Tucson Office has a longstanding relationship with UA’s College of Engineering. Regional Manager Brent M. Borchers, P.E., has been an adjunct professor for the past 7 years and Terracon employees interact with the college through its involvement with the American Society of Civil Engineering (ASCE). Terracon Materials and Geotechnical Departments have employed several interns over the years. The grant is the second the Terracon Foundation has awarded to UA in as many years. In 2017, Terracon provided a $5,000 grant for graduate students studying environmental health sciences at the College of Public Health.